In many sub-Saharan African countries, small-scale dairy farmers suffer from lack of proper refrigeration options. Larger processors can’t export milk to neighboring markets due to international standards that require the product be chilled within four hours of milking. Small-scale farmers, who contribute 80 percent of the milk, do not have access to electricity to run refrigeration units, and kerosene and solar-powered options are too expensive and difficult to maintain. These farmers may lose up to 50 percent of their milk, especially from the evening milking, to spoilage due to lack of cooling provisions. In the end, people already suffering from extreme poverty are losing a portion of their hard-earned income. 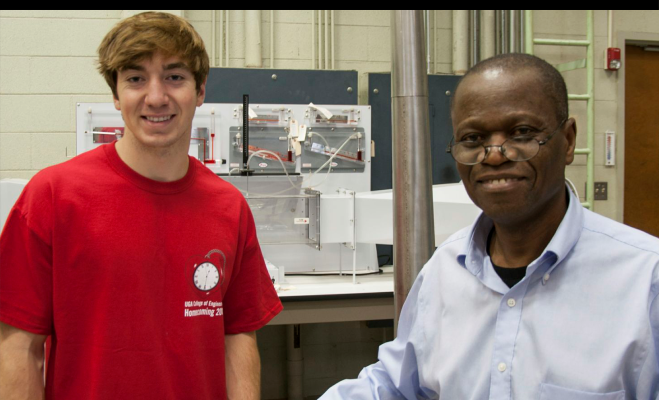 William Kisaalita, a biological and mechanical engineering professor in the University of Georgia College of Engineering, has developed a chilling method using biofuel that will help alleviate these spoilage challenges faced by African dairy farmers. To support this continuing work, Kisaalita has been awarded a $1,000,000 grant from the United States Agency for International Development, or USAID, in partnership with the Swedish Government, Duke Energy Corporation, the German Government and the Overseas Private Investment Corporation. Kisaalita developed a refrigeration unit using the principle of evaporative cooling and powered by biogas. The biogas is produced through the collection of cow manure—a resource in ample supply on dairy farms. In this unit or cooler, a container of milk is surrounded by water, and the cooler is then depressurized with a vacuum pump. A disk containing the adsorbent material zeolite, a silicate mineral, captures the evaporating water, which causes the temperature inside the cooler to drop. Once the milk is chilled, it is kept fresh overnight and is marketed the following day. Working with farmers in rural Uganda, Kisaalita will refine the design of the refrigeration unit and pilot-test the system. The team then will work with local manufacturers to secure financing and bring production of the refrigeration systems to commercial scale. 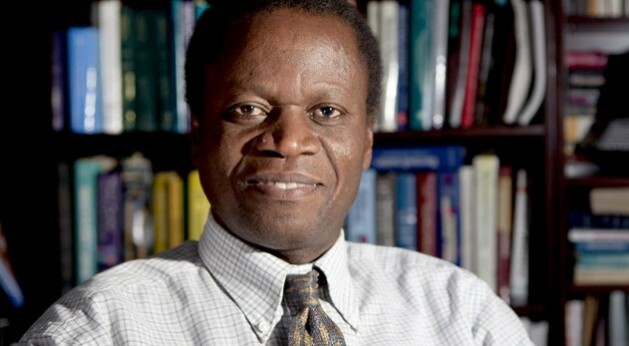 A native of Uganda, Kisaalita received his Ph.D. in chemical engineering from the University of British Columbia in Vancouver and a B.S. in mechanical engineering from Makerere University in Kampala, Uganda. 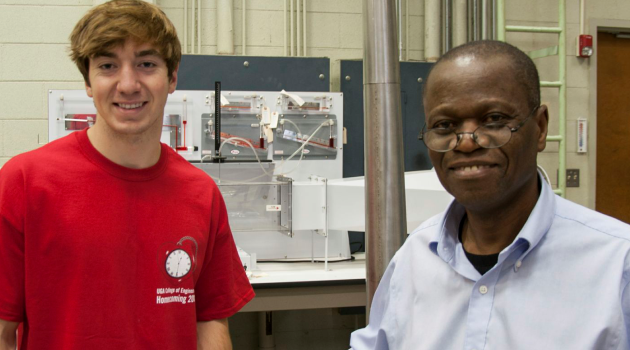 He joined the faculty at UGA in 1991, and he has been involved in various research activities and international service-learning projects that have engaged undergraduate students in developing solutions to real-world problems. Along with his teaching and research responsibilities, he has served as the associate director of UGA’s Center for Undergraduate Research Opportunities, and he is a faculty mentor for students in the Peach State Louis Stokes Alliance for Minority Participation. The University of Georgia College of Engineering is the country’s newest engineering school at the oldest state-chartered university. Offering a fundamental yet comprehensive and robust educational experience, the college prepares students to become successful, practicing engineering leaders, capable of working in complex arenas. For more information, see http://www.engr.uga.edu/. Powering Agriculture, launched in 2012, is a program designed to link renewable energy technologies with farmers and agribusinesses in low-income countries. Increasing their access to clean energy solutions allows farmers to produce more and better quality food and products and move their food to more distant markets. These advancements feed families, build businesses and empower communities with affordable, sustainable and market-based solutions. To learn more about Powering Agriculture, see www.poweringag.org. Well done Doc. on your hard work that focuses on availing possibilities to our people in Uganda. Just to let you know, there is financing at Uganda Development Bank Limited with low and affordable pricing for small scale companies, individuals with a drive to promote food security. (NB: Off-course, due diligence in good book keeping practice, is expected). I believe that farmers (whether on individual scale or at farmers group levels) with appetite for your milk coolers would find this facility a great opportunity to partake of. I would love to keep track of your developments in this regard. often, on topics that they care about, you increase the likelihood of them doing business with you. it to your own. I make boards of animals, quotes, or color combinations. n select package fr Online B Worldwide If the online critiques are something to go by, Adiphene is an efficient weight-loss option.